K's kit 45439 body, tender and bits of chassis as seen on eBay Monday 12 May 2014.
eBay at its best - the 'item' arrived on Wednesday morning, and a quick bit of work with the Dremel on the underside of the boiler soon got my spare Black 5 chassis shoe-horned in. The successful bid was £36.99. It should be said that the scratch-built chassis came off eBay years ago for about £15, and the Portsecap motor was also on eBay for £40. The only new item is the Lenz Silver decoder at £35. Total cost £117, so in the end about the cost of a new Hornby. Although strictly speaking the decoder is an 'extra', so £82 before 'customisation'. The chassis came out of the back of the stock draw on Monday having concluded something with a bit more grunt was required for the 10.30 Liverpool - Newcastle, and which the plastic bodied Jubilees and Patriots were struggling with. It was then a question of waiting for something suitable to come up on eBay - and something did almost immediately. 45439 on her first outing with 8 on, standing at the Hall Royd Home on the down East Lancs. 45439 standing next to Hall Royd Road bridge on the Up L&Y with 8 Mark 1s. There's still an issue with the lack of washers on the driving axles, so some insulation tape has been inserted behind the wheels to 'prove the concept' and prevent shorting. She's running tender first a) to prove the tender is dimensionally stable and b) the new chassis and body were fitted and tested during my lunch time, and there literally wasn't time to turn her, take the photos and get back to work! The loco arrived rather in the form of a Hornby in that there was a bag of 'extras' that needed fitting. It will be obvious from the photo that the motion bracket is missing (it was part of the original chassis) along with a sandbox, fallplate and two sets of steps fore and aft on the loco. These have all been subsequently added. The only thing K's didn't do was provide a set of cab doors. These would have been in cast metal so maybe that's just as well. A point of interest is that the original modeller chose to centre the BR logo on the tender between the rivets rather than over the centre axle box. So what can it haul and how does this compare to the unmodified Hornby? The longest train available is the Newcastle-Red Bank van train at 22-vehicles. 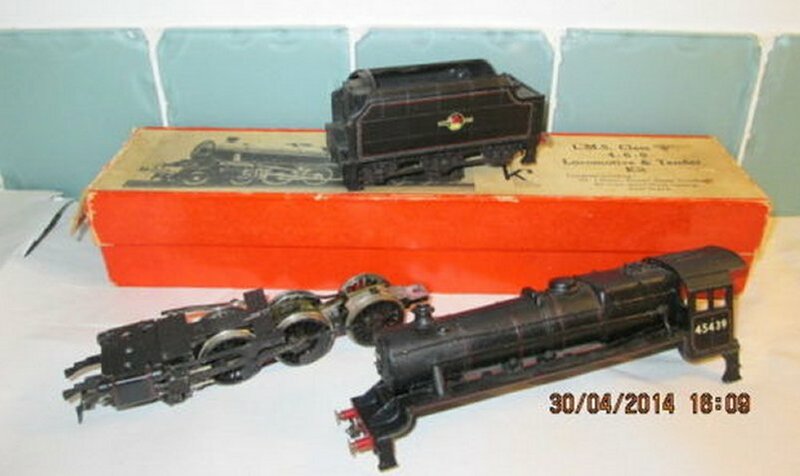 And there are three locos available for testing: 45439 as described; another K's body and tender but this time mounted on a Hornby chassis, and the Hornby Black 5 'as bought'. No surprises here. The two metal bodied locos handle the 22-vans easily, and without any sign of slipping. Crucially, if the locos if both locos are physically restrained, then the wheels do slip. So the Hornby mechanism has plenty of power, and in many ways runs as well as the Portescap mechanism, but it does need the extra weight. The regular un-modified Hornby is good for 9-vans without any sign of slipping; 11 vans at a pinch. The conclusion is probably that whilst the plastic injection molded bodies given superb detail, this is at odds with the increasing number of gizmos that are being fitted to the mechanism and so reducing the weight of the loco e.g. decoder, sound, smoke, etc. It will be interesting to see Hornby's J16 as I think there needs to be a return to Hornby Dublo-type die-cast bodies. The final twist in this particular tale is that the two Portescap Hornby Dublo 8Fs that were originally to go back on eBay have been dusted off and chipped simply because they can pull 50+ coal wagons with ease. 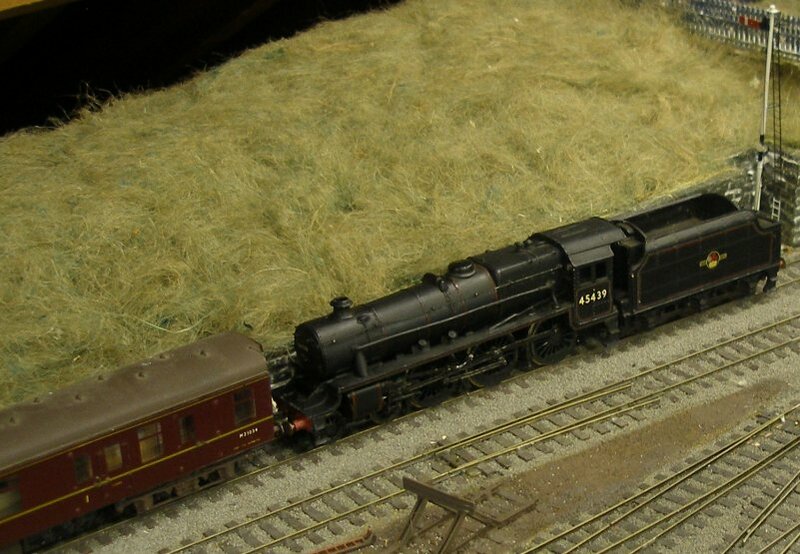 Whereas the Hornby 8F is good for about 25. Performance v looks. Vote now! Finally what about 45439? Was she a northern loco? Well, no. My 1963 loco shed allocation book shows her as being a Midlands loco, moving between Aston and Bushberry sheds before being withdrawn in November 1965. But a little more delving has thrown up some easy renumberings. 45437 and 45435 were both at Newton Heath in BR days: the former arrived from Carlisle Upperby in June 1963 and left again for Agecroft in November of the same year, whilst 45435 arrived from Wakefield in August 1956 and left for Lancaster in January 1966. Click here to see the weight of the heavy whitemetal tender was used to enhance the adhesion weight using a free bogie on the tender.